It has come to our attention that the shifting procedure of the MirageDrive® 180 can be misunderstood by some users. MirageDrive 180 directional shifting requires that the fins be free to rotate. Rotation can be hindered by contact with the well, hull bottom or obstructions. The following is a reference for properly shifting the MirageDrive 180 in either direction. Fins under the kayak should be away from the hull during any shift of direction. As a reference to proper fin position underwater… users should shift while their feet on the pedals are closer together – feet on the pedals when spread far apart (fore and aft) means the fins are closer to the hull and that may prevent the fins from rotating freely. 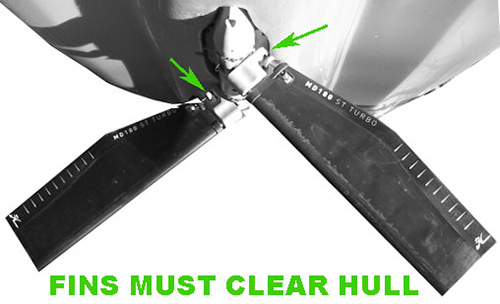 Pedal positions between a 1/4 to 3/4 of a stroke places the fins clear of the hull. Pull the shifter at a slow steady pace. 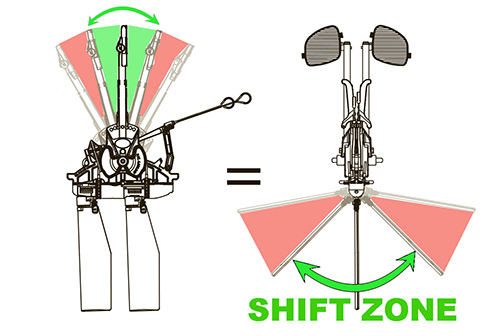 Pedaling between 1/4 to 3/4 of a full stroke and at a slow short-stroke pace will assist the fin rotation. Shifting while moving through the water rapidly and not pedaling may cause rotation resistance issues. If the fins are obstructed, pulling hard on the shifter tendons could fatigue them. This can happen if the user is not allowing the fins to rotate smoothly. Pull the shifter slowly. If a tendon were to fail, this does not disable the drive or the shift function. Users can still pedal the drive, but would have to reach further forward to shift using the lever directly. Users can create a short extension via string or wire if desired until a replacement tendon can be installed. Users with MD180 equipped kayaks should shift while their feet on the pedals are closer together - feet on the pedals spread far apart (fore and aft) means the fins are closer to the hull and that may prevent the fins from rotating. Somewhere between a 1/4 to 3/4 of a stroke gets the fins clear of the hull. Pedaling at a slow pace between 1/4 to 3/4 of a full stroke will assist the fin rotation. Shifting while moving through the water rapidly may also cause resistance issues. I have 250 miles so far on the MD 180 and have had no problems with this. With little or no speed, reverse is an easy and quick pull of the handle (tendon). The faster you are going when reversing direction, the longer it takes to slow the water flow around the fins so that they can be reversed. An over exuberant impatient person can pull the handle out in an effort to instantly reverse the fins. As can be seen in the picture below, the MD 180 fins have no restriction on reversing direction down to about 45 degrees from the hull, so continuing to stroke while reversing is perfectly desirable. If the fins momentarily hit the hull during this process it's no big deal. This feature also allows you to reverse the Drive in fairly shallow water when there is insufficient depth to reverse with the fins straight down (see bottom pic). You can also see that when the fins are in the transition phase your strokes are not providing forward thrust, but rather the fins are acting as speed brakes. Once you get the hang of it, you'll find it to be relatively fast and easy to reverse direction from any speed. This shows backing out using the flutter kick where it is too shallow to proceed further forward. The fins were partially up when reversed. Great feature! PS: This is paddle and Mirage Drive territory -- too shallow (and weedy) for props. so in English, what does all this mean? If the fins are up against the hull, as normal in shallow water, they will NOT reverse, or what? That's right -- they won't reverse when up against the hull. Thank you again Roadrunner! I've rented hobie kayak at two place and I wish they would take more time to explain everything properly. They didn't show me how to properly use the mirage drive in shallow water or how to properly reverse. I was one of the impatient one who pull too hard lol! The cord came off but I didn't break it, I was able to screw it back on.